Wall Street’s big money is not ready to dive into the booming cannabis industry. Companies in the legal-pot industry will generate nearly $7 billion in sales this year — a 25% growth rate — according to ArcView Market Research, a group that tracks the market. But the deepest investor pockets are likely to sit on the sidelines for some time to come. MedMen Management, which consults for the medical-marijuana industry, launched the $100 million MedMen Opportunity Fund earlier this week with the goal of breaking into large markets with limited licenses. Founder and CEO Adam Bierman told Business Insider he expects that the rest of the investors in this first round to be high-net-worth individuals and family offices. Chicago-based Wicklow Capital, which is the anchor investor in this round, would fit the description. But many of the larger investors, with billions in assets under management, may sit this out because pot is illegal under federal law. 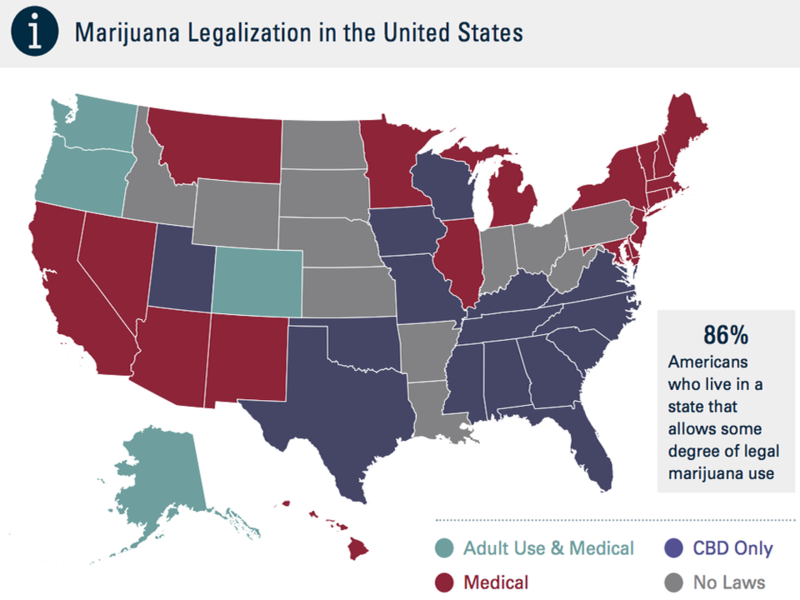 The 25 states where some ownership of cannabis is legal are fine partly because the Obama administration decided in 2009 that prosecuting medical-marijuana patients would be an inefficient use of resources. So to invest, the bigger players would have to carve out a special vice fund, and any monies poured into the industry may violate their sometimes-strict mandates. Additionally, there are virtually no established publicly traded companies dedicated to the cannabis industry in the US; at least 55 traded as penny stocks last year, according to Bloomberg. 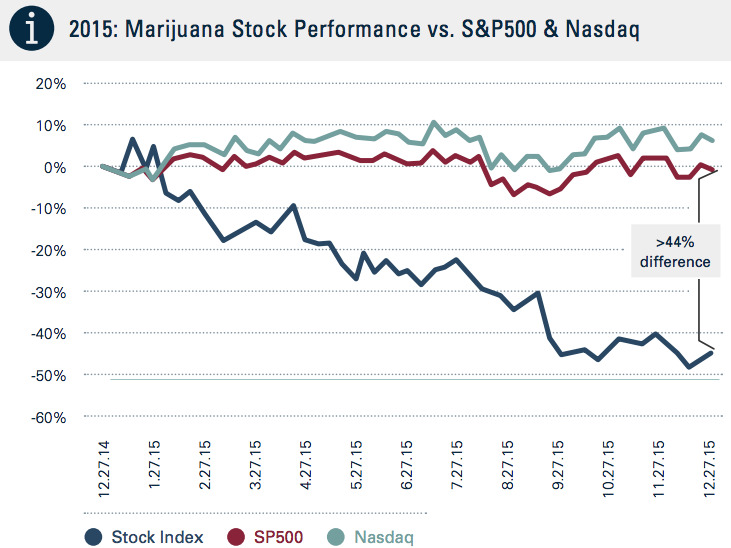 MassRoots, a social network for pot smokers, recently tried to list on the Nasdaq to go public, but was rejected. Nasdaq declined comment on the specifics. But MassRoots said the exchange thought it was assisting in selling an illegal substance — something MassRoots identified as a risk factor in its regulatory filing to go public. But five key states, likely including California and Massachusetts, will vote on legalizing marijuana in the fall. “That is the inflection moment” for the hesitation that institutional capital has toward the industry, Bierman said. But real mainstream participation may still be far off. Even if individual perceptions change, many big-money investors do not have the flexibility to quickly change their mandates, he noted. Last week, the industry got a bit of a lift from Microsoft. The tech giant announced a partnership with Kind Financial, a pot-software company, to help cannabis-business owners better comply with regulations. Microsoft had never partnered with a company in the industry before, and was the first major corporation to do so. Although Microsoft is not getting involved in the retail side of things, its involvement is still huge. Because it’s still a fledgling industry, people like Bierman have to ‘make’ the market. On one hand, MedMen and Privateer Holdings, a private equity firm focused on legal weed, are set up just like they would be in another industry. But then it’s cannabis, not an established, consolidated industry like telecoms, Bierman said. That’s impossible to hide, and shouldn’t even be. And when it comes to valuing a company for investment purposes, for example, there aren’t traditional examples, in the US at least, to compare to. So, it can end up being a take-it-or-leave-it pitch to investors who want in. If they do take it this early, Bierman said, they are in for returns that would never be repeated again.